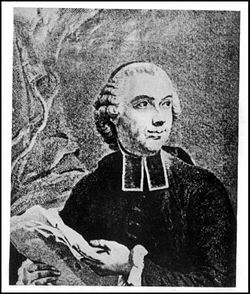 Étienne Bonnot de Condillac (September 30, 1715 – August 3, 1780) was a Roman Catholic Abbé and a leading philosopher and psychologist of the French Enlightenment. He systematized and expanded upon the theories of John Locke, making them popular among French intellectuals, and developed a theory of empirical "sensationism." He asserted that the content of the human mind is an aggregate of sensations and the mental impressions arising from them, and that there are no innate faculties or ideas. He illustrated this concept in his best-known work, Traité des sensations, with the analogy of a statue, organized internally like a human, which has its senses awakened one by one. He suggested that what is called "substance" is nothing more than a collection of sense impressions, that the "ego" is the collection of sense impressions belonging to a particular individual, and that language consist of the words associated with particular groups of sense impressions. His ideas held sway among French intellectuals for fifty years, and had some influence on the English empiricists who followed John Locke. Étienne Bonnot de Condillac was born on September 30, 1715, at Grenoble, France to a family of lawyers. Like his elder brother, the well-known political writer, Abbé de Mably, he took holy orders and became Abbé de Mureau. Supported by his benefice (financial support provided by the church), he retreated into solitude and devoted himself almost entirely to study. During his earlier days in Paris he came into contact with the circle of Diderot. Rousseau had been domestic tutor in the family of Condillac's uncle, M. de Mably, at Lyon, and this apparently led to a long friendship with Condillac. Thanks to his natural caution and reserve, Condillac's relations with unorthodox philosophers did not injure his career. His first work, Essai sur l'origine des connaissances humaines was published in 1746, followed by Traité des systèmes (1749), Traité des sensations (1754), and Traité des animaux (1755). In 1755, he was sent by the French court to Parma, Italy, to serve as tutor to the Duke Ferdinand of Parma, grandson of Louis XV, then a child of seven years. He wrote a comprehensive Cours d'études (1767-1773), in 13 volumes, for his charge. In 1768, on his return from Italy, he was elected to the Académie Française, but attended only one of the meetings, on the day of his reception. He spent his later years in retirement at Flux, a small property which he had purchased near Beaugency, and died there on August 3, 1780. Condillac was important both as a psychologist and as a philosopher of the French Enlightenment. His interest in mathematics and logic was reflected in his approach to human psychology. His first book, the Essai sur l'origine des connaissances humaines (An Essay on the Origin of Human Knowledge), subtitled “A Supplement to Mr. Locke’s Essay on the Human Understanding,” systematically summarized and explored Locke’s theory that human knowledge is deduced from two sources—sensation and reflection—and further advanced through the association of ideas. The book was widely read, and served to establish and clarify Locke’s theory among French philosophers. His next book, the Traité des systèmes, was a vigorous criticism of the innate ideas of the Cartesians, Malebranche's faculty—psychology, Leibniz's monadism and "preestablished harmony," and, above all, the conception of substance set forth in the first part of the Ethics of Spinoza. Condillac contended that preoccupation with language had led the philosophers of the seventeenth century to erroneous conclusions about the human knowledge and the nature of the mind. His third and most important work, the Traité des sensations, argued against Locke that sensation alone, and not sensation together with reflection, is the source of human knowledge. "Sensationism" was not only a theory of knowledge, but an attempt to redefine the language of science and perception. Condillac’s most influential works were Essai sur l'origine des connaissances humaines (1746) , Traité des systèmes (1749), and Traité des sensations (1754), and its successor, Traité des animaux (1755). Cours d'études (1767-1773), was written for the purpose of educating the Duke of Parma. Condillac also published a treatise on economics, Le Commerce et le gouvernement, considérés relativement l'un a l'autre (1776), and two posthumous works, Logique (1781) and the unfinished Langue des calculs (1798). Condillac's collected works were published in 1798 (23 vols.) and two or three times subsequently; the last edition (1822) has an introductory dissertation by A. F. Théry. The Encyclopédie méthodique has a very long article on Condillac (Naigeon). Biographical details and criticism of the Traité des systèmes in J. P. Damiron's Mémoires pour servir a l'histoire de philosophie au dixhuitieme siècle, tome iii. ; a full criticism in V Cousin's Cours de l'histoire de la philosophie moderne, ser. i. tome iii. Consult also F Rethoré, Condillac ou l'empirisme et le rationalisme (1864); L Dewaule, Condillac et la psychologie anglaise contemporaine (1891); histories of philosophy. Traité des sensations (1754), questioned Locke's doctrine that the senses give us intuitive knowledge of objects; that the eye, for example, naturally judges shapes, sizes, positions and distances. Condillac was convinced that it was necessary to study our senses separately, to distinguish precisely what ideas we owe to each sense, to observe how the senses are trained, and how one sense aids another. The result, he was confident, would show that all human faculties and knowledge are transformed sensation only, to the exclusion of any other principle, such as reflection. Condillac used the analogy of a statue organized inwardly like a man, animated by a soul which has never received an idea, into which no sense-impression has ever penetrated. He then unlocked its senses one by one, beginning with smell, as the sense that contributes least to human knowledge. At its first experience of smell, the consciousness of the statue is entirely occupied by it; and this occupancy of consciousness is attention. The statue's smell-experience will produce pleasure or pain; and pleasure and pain then becomes the master-principle which, determining all the operations of the statue’s mind, will raise it by degrees to all the knowledge of which it is capable. The next stage of cognition is memory, which is the lingering impression of the smell experience upon the attention, after the object exuding the smell has been removed: "memory is nothing more than a mode of feeling." From memory springs comparison, which "is nothing more than giving one's attention to two things simultaneously;" the statue experiences the smell, for example, of a rose, while remembering that of a carnation. “As soon as the statue has comparison it has judgment." Comparisons and judgments become habitual, are stored in the mind and organized into series; the powerful principle of the association of ideas. A comparison of the pleasure-giving qualities of past and present experiences gives rise to desire; desire determines the operation of our faculties, stimulates the memory and imagination, and gives rise to the passions. The passions, also, are nothing but sensation transformed. Will is desire made stronger and more permanent through the hope that it can be satisfied. The rest of the first section follows a similar line of analysis using the other senses: "Of the Ideas of a Man limited to the Sense of Smell," "Of a Man limited to the Sense of Hearing," "Of Smell and Hearing combined," "Of Taste by itself, and of Taste combined with Smell and Hearing," and "Of a Man limited to the Sense of Sight." In the second section of the treatise Condillac invests his statue with the sense of touch, which informs it of the existence of external objects. In a very careful and elaborate analysis, he distinguishes the various elements in our tactile experiences; the touching of one's own body, the touching of objects other than one's own body, the experience of movement, the exploration of surfaces by the hands. He traces the growth of the statue's perceptions of extension, distance and shape. The third section deals with the combination of touch with the other senses. The fourth section deals with the desires, activities and ideas of an isolated man who enjoys possession of all the senses; and ends with observations on a "wild boy" who was found living among bears in the forests of Lithuania. The conclusion of the work is that, in the natural order of things, substance is noting more than a collection of sensations. The “ego” is a collection of the sensations experienced by a particular human being. Sensation is not experienced to an equal degree equal in all men; and the mind of man is nothing but what he has acquired through his experience of sensations, with no innate faculties and ideas. Though this concept of the human mind as an aggregate of sensations appears deterministic, Condillac rejected determinism and appended an essay supporting freedom of the will to Traité des sensations]: "Whether we rise to heaven, or descend to the abyss, we never get outside ourselves—it is always our own thoughts that we perceive." (Condillac, Essai sur l'origine des connaissances humaines). In France, Condillac's doctrine of sensationism dominated in the schools for over fifty years, challenged only by a few who, like Maine de Biran, declared that it gave no sufficient account of volitional experience in seeking out experiences of sensation. Early in the nineteenth century, the romantic awakening of Germany had spread to France, and sensationism was displaced by the eclectic spiritualism of Victor Cousin. Some historians believe that Condillac’s concept of sensationism influenced the psychology, ethics, and sociology of the English school represented by John Stuart Mill, Alexander Bain, and Herbert Spencer; others claim that these men developed their ideas directly from John Locke. The more pragmatic English philosophers criticized the allegory of the statue as being too abstract, hypothetical and synthetic; James Mill, the father of John Stuart Mill, is said to have put Condillac’s book into the hands of his youthful son with the warning that it was an example of what to avoid in the method of psychology. Condillac based his theory of education on the idea that a developing child must repeat the various stages through which his culture has passed, an idea which, with modifications, is still held by some educators today. He also suggested the principle that the process of education should correspond to the natural development of a child. History and religion formed the base of his curriculum, and he insisted that it was necessary to establish a connection among the various fields of study. He emphasized training the student to make sound judgments rather than burdening his memory. His system has been criticized for placing philosophy and psychology ahead of the acquisition of basic skills. The "Cours d'études" (1769-1773) which he created for the Duke of Parma, includes sections on "Grammaire," "L'Art d'écrire," "L'Art de raisonner," "L'Art de penser", and "L'histoire générale des hommes et des empires." Condillac's work on politics and history, contained, for the most part, in his Cours d'études, illustrates his close affinity to English thought. In logic, on which he wrote extensively, he enlarges, with few concrete examples, upon the supremacy of the analytic method and argues that reasoning consists in the substitution of one proposition for another which is identical with it. He suggests that science is the same thing as a well-constructed language, a proposition which he tries to prove, using the example of arithmetic, in his Langue des calculs (published unfinished after his death). Condillac; Phillip, Franklin (ed.). Philosophical Writings of Etienne Bonnot, Abbe De Condillac. Erlbaum, 1987. Condillac, Etienne Bonnot de, and Hans Aarsleff. Condillac: Essay on the Origin of Human Knowledge (Cambridge Texts in the History of Philosophy). Cambridge University Press, 2001. Derrida, Jacques, and John P. Leavey (translator). The Archeology of the Frivolous: Reading Condillac. University of Nebraska Press, 1987. Knight, Isabel F. The Geometric Spirit: The Abbe De Condillac and the French Enlightenment, Yale University Press, 1968. Phillip, F., and H. Lane. Philosophical Works of Etienne Bonnot, Abbe De Condillac. Lawrence Erlbaum Associates, 1982. History of "Etienne Bonnot de Condillac"
This page was last modified on 13 August 2017, at 14:46.